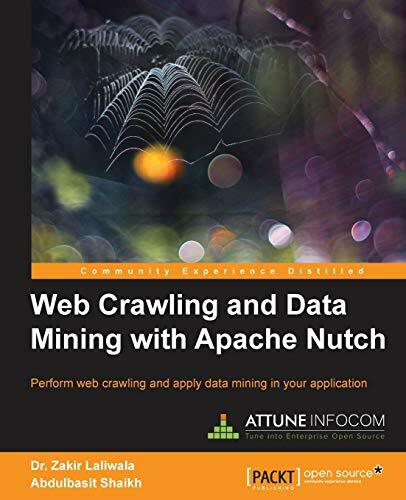 "Web Crawling and Data Mining with Apache Nutch" shows you all the necessary steps to help you in crawling webpages for your application and using them to make your application searching more efficient. You will create your own search engine and will be able to improve your application page rank in searching. "Web Crawling and Data Mining with Apache Nutch" starts with the basics of crawling webpages for your application. You will learn to deploy Apache Solr on server containing data crawled by Apache Nutch and perform Sharding with Apache Nutch using Apache Solr. You will integrate your application with databases such as MySQL, Hbase, and Accumulo, and also with Apache Solr, which is used as a searcher. With this book, you will gain the necessary skills to create your own search engine. You will also perform link analysis and scoring that are helpful in improving the rank of your application page. This book is a user-friendly guide that covers all the necessary steps and examples related to web crawling and data mining using Apache Nutch. "Web Crawling and Data Mining with Apache Nutch" is aimed at data analysts, application developers, web mining engineers, and data scientists. It is a good start for those who want to learn how web crawling and data mining is applied in the current business world. It would be an added benefit for those who have some knowledge of web crawling and data mining. Dr. Zakir Laliwala is an entrepreneur, an open source specialist, and a hands-on CTO at Attune Infocom. Attune Infocom provides enterprise open source solutions and services for SOA, BPM, ESB, Portal, cloud computing, and ECM. At Attune Infocom, he is responsible for product development and the delivery of solutions and services. He explores new enterprise open source technologies and defines architecture, roadmaps, and best practices. He has provided consultations and training to corporations around the world on various open source technologies such as Mule ESB, Activiti BPM, JBoss jBPM and Drools, Liferay Portal, Alfresco ECM, JBoss SOA, and cloud computing. He received a Ph.D. in Information and Communication Technology from Dhirubhai Ambani Institute of Information and Communication Technology. He was an adjunct faculty at Dhirubhai Ambani Institute of Information and Communication Technology (DA-IICT), and he taught Master's degree students at CEPT. He has published many research papers on web services, SOA, grid computing, and the semantic web in IEEE, and has participated in ACM International Conferences. He serves as a reviewer at various international conferences and journals. He has also published book chapters and written books on open source technologies. He was a co-author of the books Mule ESB Cookbook and Activiti5 Business Process Management Beginner's Guide, Packt Publishing. Abdulbasit Shaikh has more than two years of experience in the IT industry. He completed his Masters' degree from the Dhirubhai Ambani Institute of Information and Communication Technology (DA-IICT). He has a lot of experience in open source technologies. He has worked on a number of open source technologies, such as Apache Hadoop, Apache Solr, Apache ZooKeeper, Apache Mahout, Apache Nutch, and Liferay. He has provided training on Apache Nutch, Apache Hadoop, Apache Mahout, and AWS architect. He is currently working on the OpenStack technology. He has also delivered projects and training on open source technologies. He has a very good knowledge of cloud computing, such as AWS and Microsoft Azure, as he has successfully delivered many projects in cloud computing. He is a very enthusiastic and active person when he is working on a project or delivering a project. Currently, he is working as a Java developer at Attune Infocom Pvt. Ltd. He is totally focused on open source technologies, and he is very much interested in sharing his knowledge with the open source community.